Nathan Hines was part of the only other Scotland side to face Georgia back in the 2011 World Cup and admitted that they perhaps underestimated the east Europeans in that pool match in Invercargill. 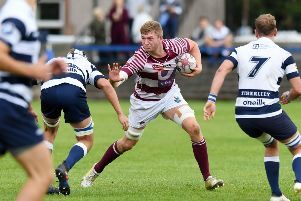 Hines reflected on the 15-6 victory five years ago, when Dan Parks kicked the Scots to an uninspiring, grinding victory over a side that was then coached by Scotsman Richie Dixon. “We didn’t score a try in that game and we were quite lucky if I’m being truthful,” recalled Hines. Scotland go into today’s match at Rugby Park hoping to finish the autumn Test series on a high note and build on the performances posted already this month against Australia and Argentina. Former lock Hines joined Vern Cotter’s staff as a “resource coach” working with the national team and academy prospects, but he will leave with his old Clermont Auvergne boss Cotter to assist him at Montpellier next season and is looking forward to that new adventure back in France, where he also played for Perpignan during his fine 77-cap career. Hines insists the last few games under he and Cotter’s guidance are all about the players and not about them, and he is fully focused on helping get that win today against opponents who are keen to show they belong at the top table of European rugby. “In their own right they are outstanding rugby players but together they have an understanding,” said Hines. “They understand each other and can talk to each other more than as if it was just another team-mate. They spend a lot of time together which is good for second rows as they can talk about the game. “The head feels much better and I’m looking forward to getting back playing,” said the 27-year-old, who will be winning his 61st cap today. “I play against them quite regularly. In fact we have the loosehead prop who plays for us in Toulouse,” said Gray. “They are very abrasive players, very strong and aggressive and we expect that.